Take this free practice exam to get a sample of the types of questions that are on the NCLEX-RN exam. The actual NCLEX exam includes these categories: Basic Nursing Care, Management and Practice Directives, Preventing Risks and Complications, Caring for Acute and Chronic Conditions, Safety, Mental Health, Pharmacology and Growth and Development. 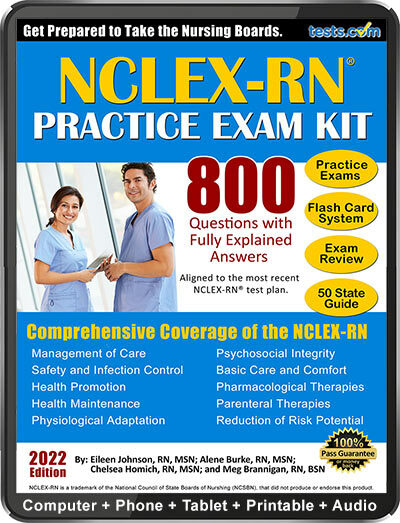 To prepare for your RN licensure exam, see the complete Practice Exam for the NCLEX-RN with 400 questions, written by nursing expert and medical writer Meg Brannagan, RN, BSN, Nurse Curriculum Writer. 1. In which of the following ways can the nurse promote the sense of taste for an older adult? As clients age, their sense of taste may diminish, reducing the joy that comes with eating. A nurse can promote the sense of taste for a client by encouraging him to chew his food thoroughly while eating. This results in longer contact of food with the taste buds and a greater chance of tasting the food. 2. Which of the following is classified as a prerenal condition that affects urinary elimination? A prerenal condition is that which causes reduced urinary elimination due to a diminished blood flow to the kidneys. A condition such as cardiac tamponade affects the heart's ability to pump adequate amounts of blood, thereby reducing blood flow to vital organs throughout the body, including the kidneys. 3. A nurse is assessing an African American client for risks of a pressure ulcer. Which of the following best describes what the nurse might find with an early pressure ulcer in this client? When assessing for signs of developing pressure ulcers in a client with dark skin, decreased circulation may not always be readily apparent. For instance, blanching, the red undertones seen in light-skinned clients, will not always be present. Instead, the skin of an early pressure ulcer may develop a purple or bluish color. 4. At the beginning of the shift, a nurse receives report for her daily assignment. Which of the following situations should the nurse give first priority? When prioritizing needs of clients, the nurse must begin with the unstable client or manage conditions that affect airway, breathing, or circulation first. The client with COPD has a condition that affects breathing and is exhibiting decreased oxygen saturation levels; therefore, this client should be the first priority. 5. Mr. W has orders for a physical therapy consult. The nurse contacts the appropriate department but 12 hours later, no one has come to see the client. Which is the most appropriate action of the nurse? Nurses must typically work as part of a larger interdisciplinary team that involves collaboration with other professionals. In order to fulfill the client's needs, communication between disciplines should remain respectful, with clear directions about each discipline's responsibilities. Communication between all parties minimizes confusion about the client's care. The "B" in the SBAR acronym stands for Background. The SBAR is a communication tool used between providers that regulates the type and amount of information given. When contacting a physician, the nurse provides information about the situation, the client's background, the nurse's assessment, and further recommendations. 7. Which of the following nursing interventions is appropriate for a client who is suffering from a fever? Interventions for a client who is suffering from a fever include increasing the client's volume of fluid and providing oxygen. A fever increases the body's metabolism, causing the client to breathe at a faster rate and increasing the work of the heart. The client is at risk of fluid loss due to increased respiration and sweating. The increased work of the heart requires more oxygen to maintain perfusion to the tissues. Heat exhaustion occurs when a person has enough diaphoresis that he becomes dehydrated. Intense sweating can cause both fluid and electrolyte imbalances. Untreated heat exhaustion can lead to heat stroke, which results in organ damage, loss of consciousness, or death. 9. A nurse is attempting to assess a client's pulse in his foot. She palpates the pulse on the anterior aspect of his ankle, below the lower end of the medial malleolus. Which type of pulse is this nurse taking? The nurse can palpate the posterior tibial pulse to assess circulation to the foot and ankle. The posterior tibial pulse is felt by palpating the inner side of the ankle, behind the medial malleolus. 10. Mrs. J is in the adult ICU on a ventilator. The nurse caring for her recognizes that her endotracheal tube needs suctioning. Based on the nurse's understanding of this procedure, what level of pressure should the nurse apply while suctioning? When suctioning the endotracheal tube of an adult client, the nurse should set the suction apparatus at a level no higher than 150 mmHg, with a preferable level between 100 and 120 mmHg. Suction pressure that is too high can contribute to the client's hypoxia. Alternatively, too low of suction pressure may not clear adequate amounts of secretions. 11. The nurse caring for Mrs. J is prepared to suction her endotracheal tube. Which of the following interventions will reduce hypoxia during this procedure? Before suctioning a client's endotracheal tube, the nurse should provide extra oxygen for approximately 30 to 60 seconds. Hyperoxygenating a client before suctioning increases oxygen delivery to the tissues and reduces hypoxia that may develop during the procedure. 12. Which of the following conditions is a contraindication for performing a diagnostic peritoneal lavage? Diagnostic peritoneal lavage is contraindicated in clients who are morbidly obese because excess body fat makes finding essential landmarks for this procedure difficult. Additionally, the equipment used for the procedure may not be large enough to accommodate an obese person. Finally, morbid obesity puts excess strain on the cardiovascular and respiratory systems, such that anesthetic agents used during the procedure could cause further complications. 13. Which of the following is an example of client handling equipment? Client handling equipment is designed to reduce the stress and workload on nurses who must assist, turn, or lift clients. This equipment decreases the risk of injuries associated with improper lifting. A height-adjustable bed raises the client up to a proper working height for the nurse who must provide assistance. 14. Which practice will help to reduce the risk of a needlestick injury? When administering an injection or using sharps for a procedure, the nurse can minimize safety risks by keeping a sharps container nearby. This provides easy access for quick disposal to prevent the possibility of a needlestick. Needles should never be recapped after use and nurses should always exchange needles from a central area rather than passing them between workers. 15. Which of the following is an organizational factor that affects workplace violence directed at nurses? Understaffing of nursing personnel may be an organizational risk associated with workplace violence for nurses. Understaffing involves too few nurses on duty, which may not be enough to meet client needs at the time or may result in longer delays for provision of care. Greater amounts of activity and diminished numbers of nurses to provide care may result in aggression, violence, or anger from clients or families directed toward staff. Mutual pretense is a form of awareness as a response to death or dying in which those involved avoid discussing the situation. In a case of terminal illness, a client and his family are aware of the diagnosis; but the client may not want to talk about the situation for various reasons, such as saving his family from feelings of grief, fear of the future, or discomfort with talking about feelings. 17. A nurse is preparing to talk about body changes with a client who just had a bilateral mastectomy. Which of the following actions of the nurse is most appropriate during this discussion? When preparing to talk with a client about a difficult subject, the nurse can provide an environment that is private and that offers minimal distractions. This gives the client an opportunity to open up about personal feelings without being interrupted, and may provide more open communication between the nurse and client. 18. A nurse is attempting to speak with a client about his personal feelings of self-esteem and self-concept. Which of the following questions is most appropriate for assessing a client's personal identity? a. "What is your educational background?" b. "Are your parents still living?" c. "What do you like about your life right now?" d. "Where do you see yourself in 10 years?" When assessing a client's personal identity, the nurse should focus on questions that determine how the client feels about himself. This may mean asking questions that help him identify his personal strengths and weaknesses, as well as how he thinks others see him. A suspension is a type of medicine that combines medication particles with a liquid solution. When not administered, medication particles within the suspension may settle to the bottom, requiring the nurse to shake the solution to mix. Suspensions are typically given as oral solutions. 20. Following a dose of medication, a client develops inflamed mucous membranes and nasal discharge. What type of minor reaction is this client experiencing? Rhinitis may occur as a mild reaction following some types of medication administration. Rhinitis involves itchy or inflamed mucous membranes, particularly around the eyes, nose and mouth. The client may also develop swelling of the nasal passages or clear discharge. 21. Mr. Y is receiving medication through a catheter that has been placed into the subarachnoid space of his spinal column. What route of medication administration is this called? Medications administered through the intrathecal route are given through a catheter that has been placed into the subarachnoid space of the spinal column. These medications are given into cerebrospinal fluid, often for pain control. Placement of an intrathecal catheter is typically done by a trained physician or advanced-practice nurse. 22. Which of the following complications is associated with premature rupture of membranes in the pregnant client? Premature rupture of membranes occurs when the amniotic sac of a pregnant client has ruptured before the onset of labor. The client may be at increased risk of chorioamnionitis, which occurs as inflammation of the membranes of the placenta. Infection may develop when bacteria ascend into the uterus without the protection of the intact amniotic sac. 23. A nurse is caring for a child whose parents live in a home with several other unrelated children and adults. Some of the people who live in the home have visited and the nurse discovers that this group all shares finances and living conditions. What type of family is this most likely an example of? A communal family is a group classified as a non-traditional family. In this situation, adults who are not related may live and work with other adults and their children all together in a household. The communal family may share expenses, food, and childcare in the same way as a traditional family. 24. A nurse is educating a female client about progesterone. Which of the following information is appropriate to include in this teaching? Progesterone is a hormone that is produced by the ovaries in women. Progesterone affects the tissue of the endometrium by developing the lining of the uterus in support of embryo implantation. In pregnant women, progesterone nourishes the uterine lining and limits uterine contractions to prevent miscarriage. In order to become a registered nurse and be licensed by one's home state, nursing candidates must take and pass the NCLEX-RN. This computerized exam includes questions that help a licensing board to determine if a candidate has the skills and knowledge to be a successful nurse. Learn more with our NCLEX-RN Test Guide.